The 2017 Fireside Sessions may be over, but the spotlights on our participants are not! As we’ve mentioned before, one of the best parts of these workshops is getting to know other small business owners and making true connections and friendships. 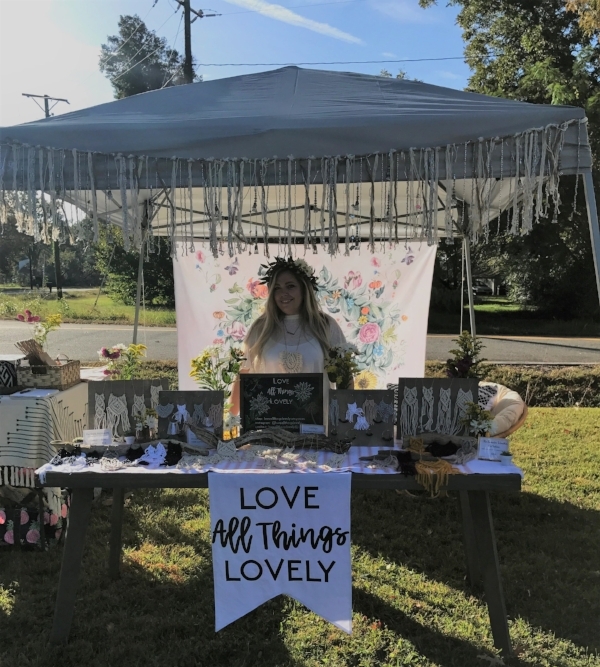 One of these connections we’ve made is with Heather Stevens, owner of Love All Things Lovely, and a participant at three of the four Hampton Roads Sessions. Heather has been a dream to have in our classes - asking important questions and bringing in the perspective of a true creative entrepreneur. Read on to find out more about her extremely-niche jewelry brand. What does your business do, create or provide? I hand-make macrame necklaces and earrings. What compelled you to start this business? I'm a crafting addict, lover of fashion and design, and more recently, obsessed with fiber art. When I realized that I could incorporate all of my passions at once I couldn't stop! I knew then it was time to start a business. I love the artistic freedom to create. I am also a stay at home mom, so I get to make my own hours and spend time with my kids! What do you like the least about owning your own business? What’s a real “WIN” you've experienced in your business? The other day I was out with some friends and a couple girls recognized me from following my business on Instagram. I thought that was pretty cool and it was great to be able to connect face to face with ladies who have similar interests as me. Make sure it is something you are 100% passionate about because even though it is something you love doing, there is still a lot of sacrifice involved. Also, have a good support system because there are always going to be times of self doubt, and it is so important to have someone to encourage you to keep moving forward! What really spoke to you during the Fireside Sessions you attended? If you’d like updates about future Fireside Sessions or other upcoming events, please sign up for our newsletter and follow us on Facebook.